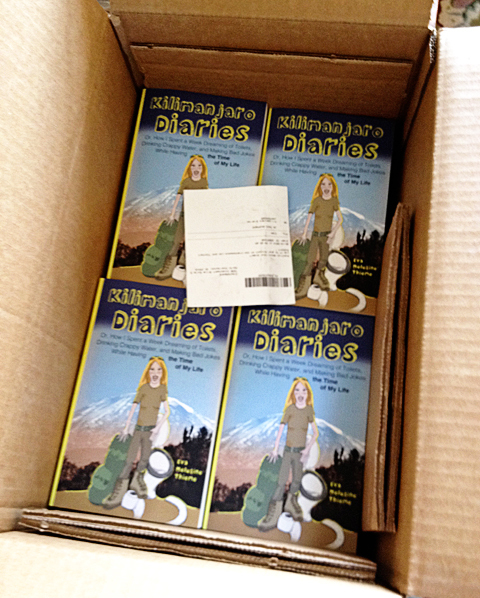 The sales of my first book, Kilimanjaro Diaries, have been trickling in, one at a time, but nothing overwhelming. Once you’ve exhausted the group of your friends and acquaintances who are most willing to pay real money for your writing – even if it’s only $3.99 – it becomes somewhat harder to reach new readers. You might score the occasional coup that gives you a few days worth of giddiness. Like the arrival of your first genuine fan mail. Or the kid in Germany who thinks your book is an international bestseller because both Mom AND Grandpa are currently reading it (except, both Mom and Grandpa are related to the author). Or the friend who just told you her mother laughed until she cried while reading your book. Or the actual bookstore with a renowned name (Parnassus Books) which agreed to host a book signing for you on September 23, 2014 (mark the date!). And you might have some other marketing schemes up your sleeve, like participating in Amazon’s KDP Select program, which most fellow writers seem at best lukewarm about. It allows you to give away your book for free on Amazon for a few days of your choosing so that you can reach a wider audience, but unless you have a second book for sale at the same time, so as to profit from those new readers you might have gained by giving away your book for free, you won’t really increase your sales numbers (at least not in dollar terms). In short, I am learning what every self-published author learns: Selling books is HARD! Why do I do this? Because I want to believe that there’s some magic secret to weight loss that’s just waiting for me to discover it, and I want to believe it because I don’t want to do the hard work. So instead of starting the hard work, I keep searching for the secret while, in the meantime, the circumference of my thighs continues to be in direct proportion to my love of Toblerone cheesecake. This is exactly what happens to self-published authors, minus the cheesecake. Instead of considering the time, hard work and common sense that has led to hundreds of self-published authors making money but not necessarily headlines, they dream of emulating the handful who did little other than upload to KDP before they found themselves sleeping on mattresses stuffed with cash. We’re not going to do that. We’re going to get our arses on the treadmill right now. I suppose you’ll now want to know the How. How DO you sell books as self-publishing authors? Well, you’ll just have to get Self-Printed and continue reading for yourself. I promise you won’t only get a lot of detailed information, you’ll also be very entertained by Howard’s engaging and humorous prose. I can’t wait to have seven hours each day to myself again. And I can’t wait to sleep on mattresses full of cash. Mmm… The smell of cash has a soothing aromatherapy effect. Ha, cash as aromatherapy, I like it! Yes, that’s the conundrum. In order to justify to our family and friends (and even ourselves) that it’s important for us to spend time and energy on writing, we must be able to earn money from it, but we can’t make money from it unless we hoard some time and energy to write. In the meantime, everyone thinks we’re crazy. Ah, the writer’s life! Spot on! That’s the best summary of what goes on in a writer’s mind that I’ve come across.